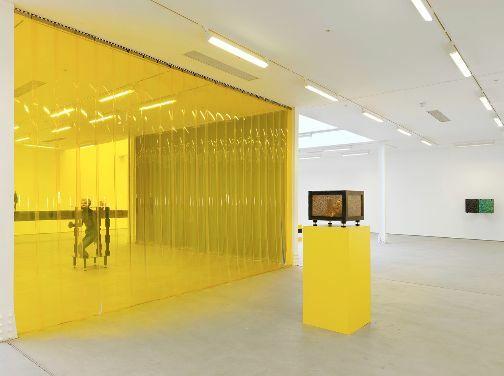 Steven Claydon presents The Gilded Bough, his second solo exhibition at Sadie Coles HQ in London. The exhibition brings together sculptural and installation works which explore notions of authenticity, ‘objecthood’, currency and cultural value formation. The pieces in the exhibition simultaneously produce and evade meaning, making apparent the processes by which values are attributed to objects dependent on the coming together of form, texture, context and space. Through the selection and arrangement of the pieces the artist examines the identity of the cultural artefact. The title of the exhibition The Gilded Bough both refers to and mutates the title of the late Victorian anthropology book The Golden Bough by James Frazer. Concealment plays an important role in The Gilded Bough. Claydon engages with the idea that structures and relationships are revealed through acts of erasure or exclusion. A number of dualities are explored - surface and material composition play different, but related roles in the formation of cultural artefacts; the same can be said for economic and cultural narratives. Claydon examines the idea of the aura as a moment in which such dialectics suspend and oscillate. Steven Claydon has recently been shortlisted for the Hepworth Prize for Sculpture. Winners will be awarded to an acclaimed British sculptor by the Hepworth Gallery in Wakefield and will receive a £30,000 cash prize. Fellow nominees include Phyllida Barlow, who will represent Britain at the 2017 Venice Biennale, Helen Marten and David Medalla. The Guilded Bough runs from 1 March – 1 April 2016 at Sadie Coles HQ at 62 Kingly Street London W1B 5QN.